We are excited to announce our next official event at “Pan y Vino: pintxos y tapas” ! 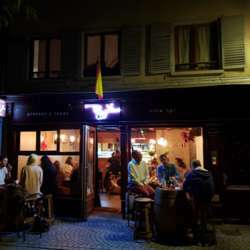 This new “Bar à vin” is dedicated to Basque tapas. For lovers of Mediterranean cuisine the setting is idyllic! We offer a welcome drink for our guests: a glass of sangria, chef’s wine, beer or soft drink. As well as, some complimentary nibbles of ham and “ibérique” cheese. Don’t forget to sign up for the event. It helps for the organization, gives you a discount and most importantly, a beautiful name tag with your name and country’s flag, printed with love. If you are new in town or new to InterNations don’t hesitate to come alone. Feel free to bring your international connected friends. Please note: this event has a limited number of places, if you are not able to attend, please take time to cancel your attendance to let other people join. The guest list will close on 26 February at 17:00 .